Green Arrow #6 shifts the focus off of Green Arrow and Star City as it follows Emiko and Shado back to Tokyo. 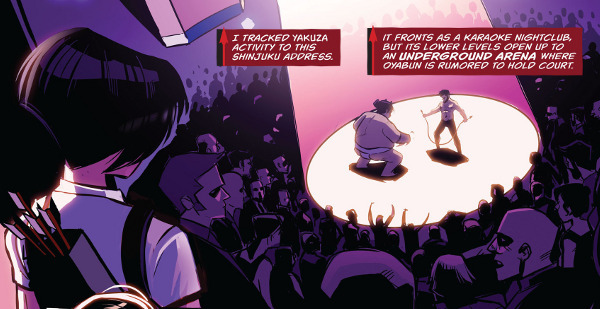 Burdened by the betrayal she's committed, we're given flashbacks of Emiko's time with Ollie in Star City while she works out a way to put things right with the Yakuza who, unknown to her, Shado was still working for as a mole for the Ninth Circle. The change of pace works well for the comic while helping fill us in on Emiko and where she currently stands. The flashbacks also give us glimpses of other mistakes she made in Star City including an attempt to prove herself worthy of being Green Arrow's new sidekick by doing a little snooping which led both her, and Ollie, to fall under the influence of the Clock King. The issue works well, and I'm also pleased with the new art direction as Stephen Byrne takes over for Juan Ferreyra as the comic's new artist. I'll be curious to see how long the comic sticks with Emiko in the lead (with Ollie only in flashbacks). Worth a look.